Those of you who live in cooler climates will just have to excuse those of us who make a big deal out of the snow (however brief) that we experienced this past Wednesday. Yes, it lasted for less than 3 hours. Yes, it was a meager covering. And yes, it's just snow. But we've learned to appreciate each rare occurance of snow to our part of the world because they are so few and far between. So, I woke up at about 7:30 am to a very pretty blanket of snow covering everything in our neighborhood accompanied by big, fluffy snowflakes still falling. 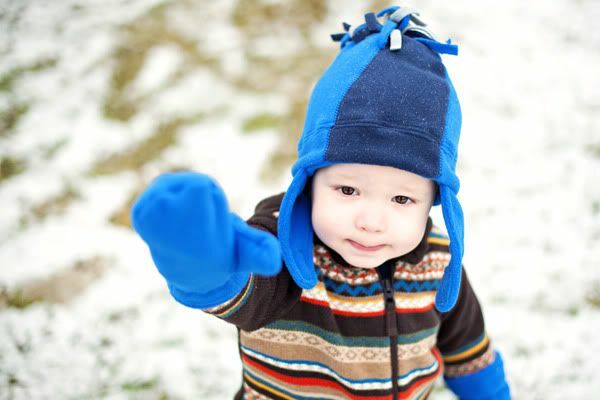 By the time we had the boy bundled up and out the door (after breakfast) an hour later, the snow had almost turned to rain and the snow was no longer a pretty blanket. 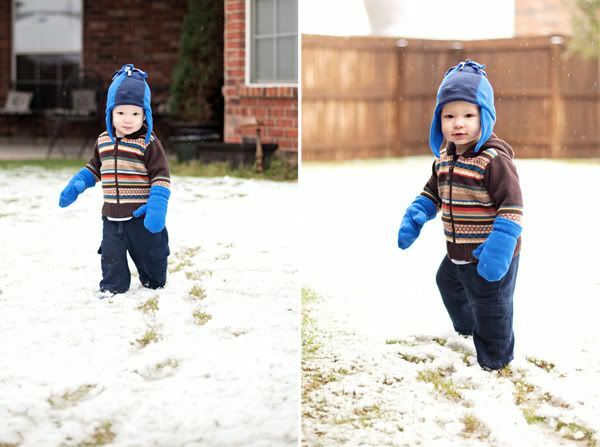 But still, Ethan got to romp around in it for a while and was not happy when I made him go back inside. Temperature...neither extreme heat nor cold...seems to dissuade him at all from wanting to be outside a good bit of the time. I am not complaining about that, by the way. This was his first time to wear mittens and I was convinced that he would hate them. But surprisingly, he kept them on and any time he has seen them the past few days, he brings them to me to put them on his hands. I might sound like a broken record, but I LOVE this sweater too! He is such a cutie! Snow is amazing! We had snow today which is a rarer occurrence than snow for you! It's so fun!